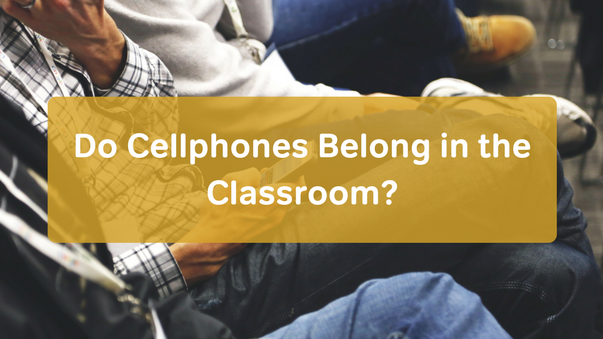 Do Cellphones Belong in the Classroom? Recently, I watched as a group of elementary school students got off the school bus. To my surprise, many of them were looking down at cellphones. There was even a kindergartner or two who were talking on cellphones. As more and more students receive personal devices, part of a teacher's classroom management needs to answer the question: do cellphones belong in the classroom? To determine the answer, here are some of the pros and cons of allowing students to have their cellphones in class. Parents receive peace of mind, knowing they can communicate with their students throughout the day. With the number of incidents occurring at schools, cellphones can increase students’ feelings of safety and security. They know they can contact parents and law enforcement if something happens. Students can look up answers to things that they have questions about but may be too embarrassed or nervous to ask the teacher. The devices can enhance students’ learning experience through videos, research, teaching apps, and more. Students who benefit from listening to music while working can use devices to enjoy music while completing classroom assignments. By texting and emailing others in the classroom, students can collaborate on activities and projects. The EPA discourages children’s exposure to technology. By allowing cellphones in the classroom, students may end up having too much time in front of a screen throughout the day. With the amount of games, social media apps, and other things that students can do on their devices, cellphones can quickly become too distracting during class time. Cellphones with Internet capabilities allow students to access inappropriate material while at school. Teachers can’t screen what students are viewing or listening to on their devices. Through texting and social media apps, students are vulnerable to cyberbulling and child predators. Cellphones can cost hundreds of dollars, which make them a prime object of theft among students. When students are able to text each other while taking tests or completing assignments, it’s possible for them to cheat. Not every student can afford a phone. Allowing cellphones in the classroom shines a light on income disparity between students, which can make some students feel inferior to their classmates. Do cellphones belong in the classroom? In my opinion, there is a time and place for everything. I don’t want cellphones out during class instruction unless there is an activity that could benefit from allowing students to use their cellphones. The decision for allowing students to have their cellphones in your classroom is up to you. Think about the pros and cons, and consider how cellphones could impact your students to help you decide.